Bridal Bee's Blog on Flower Girls & Beyond: Lovely London and her Dashing Brother Phoenix! Lovely London and her Dashing Brother Phoenix! We hope you are all having a happy and safe holiday! Today I will be sharing with you a fun and fancy Christmas photo! Athena Kleinschmit shared with us on our Facebook wall a photo of her son Phoenix and her daughter London! 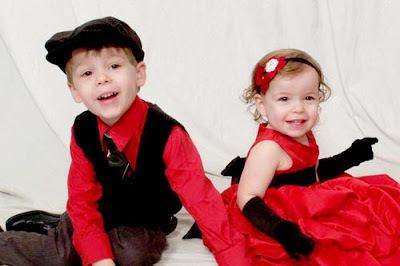 "Thanks for helping to make Christmas pictures a success! We LOVE the bubble satin dress. :)"
Wow! There's so much to love in this picture! The black and red color scheme looks fitting for both a 1920's themed party and an Old Hollywood elegant soiree! This is a great Christmas picture and Phoenix and London look ready to ring in the New Year! In this photo, only London is wearing a NancyAugust.com outfit and her mommy paired the dress with beautiful black gloves! Although Phoenix isn't wearing one of our suits, he sure looks dashing and matches his baby sister perfectly! What happy and adorable children! Thanks Athena for sharing your photo with us! London is wearing NancyAugust.com's Satin Red Baby Dress with Bubble Layered Skirt, Item Id: GG3319B-RED. The rich and decadent red color is amplified on a smooth and shiny satin fabric! A simple bodice and black satin waist sash provides balance to a full, triple layered bubble skirt! The style of this dress is quite versatile and with the right accessories, your baby can evoke charm and brilliant youth like London, who paired black satin gloves and a darling floral headband with her dress. You can also pair this dress with a pearl necklace to create a look of old-world romance and vintage beauty. Perfect for color themed weddings and other special events, not only is this classic style available in many different colors, but you have a choice of 17 different waist sashes to accompany your dress! This is a beautiful and fun dress that will make dressing up for your next special event not only easy, but enjoyable! 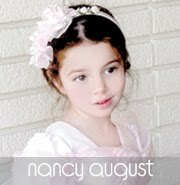 If you would like to be featured on our blog, please send us a photo of your little one wearing his or her NancyAugust.com purchase to: Info@NancyAugust.com! A Trio of Terrific Flower Girls!